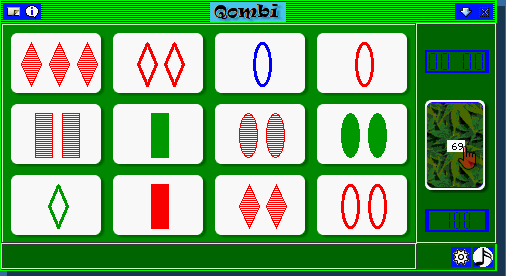 Qombi is a new game from Per Witte. It runs on modes 16 to 33 GD2 colour systems only and needs just under 1MB of fast disk space and 1MB RAM with a minimum screen resolution of 512 x 384 pixels. There are 81 cards. Each card has four attributes: Shape, Number, Colour, and Fill. Each attribute has three different “states”: The shapes are Ovals, Diamonds, and Rectangles. Numbers are One, Two and Three. Colours are Red, Green, and Blue. The fills are Full, Shaded, and Empty. A trick is any three cards that have from zero to three attributes in common, with all the remaining attributes being different. Points are given for each trick removed: one for each difference, two for each similarity. The points double for each extra trick removed without replenishing. Replenishing costs three points, unless you remove all the cards from the table in one turn. select one or more cards and have them replaced. Each card replaced costs three points. You can choose to play a timed game, it which case you start off with 20 extra points. However, each minute used, costs one point. No news yet on a release date at the time of writing, sadly. This entry was posted in News and tagged Qombi on 16/03/2019 by Dilwyn.